A New York journalist who has covered the AIDS epidemic for 30 years, first-time filmmaker David France has assembled a superb record of the decade-long fight for a viable treatment protocol and an intimate portrait of the personalities leading the charge. January 1981 marked the first known AIDS death; there were 41 cases that year. A half-dozen years later, when How to Survive a Plague picks up with the formation of activist AIDS group ACT UP, the virus had claimed 500,000 lives worldwide. By the time this story ends in 1996 with the development of a combination drug therapy that actually works, 8.2 million people had died. How to Survive is indeed a tale of survival, but the AIDS community didn’t get there without a fight—and a steep personal toll. Serendipitously, the arrival of HIV coincided with the availability of consumer-grade camcorders, and as a result, much of this developing story—from private conversations to public protests—was recorded for posterity. 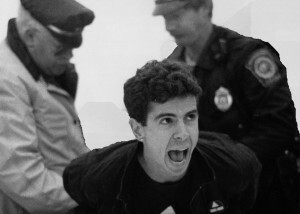 France combines this historic footage, courtesy of more than 30 videographers, with archival news reports and present-day interviews to craft a complete picture of the founding, mission, strategies, in-fighting, splintering, failures and successes of ACT UP, a Greenwich Village-based protest group that forced government agencies and health organizations to take AIDS seriously and invest in finding a cure. At the heart of France’s telling are Peter Staley, a deeply closeted bond trader who quit his job to become an AIDS activist and spokesperson for ACT UP; Mark Harrington, a college grade with a literature degree who spearheaded ACT UP’s influential Treatment and Data Committee; and Bob Rafsky, a doting father who infamously heckled Bill Clinton during the 1992 presidential campaign. For most of the documentary, we get to know these men and their comrades solely through video recorded at the time of these activities. They constantly discuss their impending deaths; whether they survive is saved for the end of the film. France wields expert control throughout, interlacing material from various sources to paint a comprehensive picture. He allows the film to match in pace the escalation of ACT UP’s own protests, which include the staging of a kiss-in at St. Vincent’s to protest the hospital’s treatment of gay patients; interrupting Catholic mass to object to the bishops’ opposition to condoms; draping Senator Jesse Helms’ home in a giant prophylactic; and throwing the ashes of loved ones onto the White House lawn. Often, France lets these events play out without comment to powerful effect. How to Survive a Plague ends on an emotional yet upbeat note. With drug treatments that ACT UP and others fought so hard to develop, AIDS is not the death sentence it was in the ’90s. Still, not all those infected can afford them, rendering France’s film at once a fascinating history and a compelling call to action.